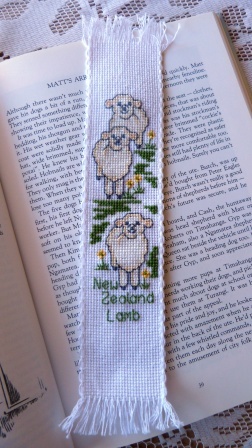 Over at Our Craft Forum we recently had a bookmark swap. For my partner I decided to make a cross stitch bookmark, so went to our local Bernia shop and picked up this cute New Zealand Lamb one. Unfortunately whenever I see the words New Zealand Lamb I think of a yummy juicy roast. I do hope that Willoger likes the bookmark. They are precious ... a delightful bookmark.